The original quilt was made by Frances Long Frey of Chambersburg, PA. Fanny, as she was called was born 31 March 1825 and died 23 May 1895. On 22 December 1846 she married Christian Frey Jr. Both are buried in the family cemetery on the Frey farm in Greene Township, Franklin County, PA, along the north edge of Chambersburg. They were Mennonite and lived on a farm which had been in the Frey family since 1791. Fanny was my late wife’s great-great grandmother. The appliquéd quilt remained in the family for 100 years. While it was quilted, apparently on a winter evening, a fat oil lamp spill made a mark on it. When finished, it was packed away and never used or given to a friend, likely because the lamp oil spill made it imperfect. When it was finally offered at a household auction in April 1982, an antique dealer outbid the family. He said he would sell it to a collector in Ohio. It’s location is unknown today. 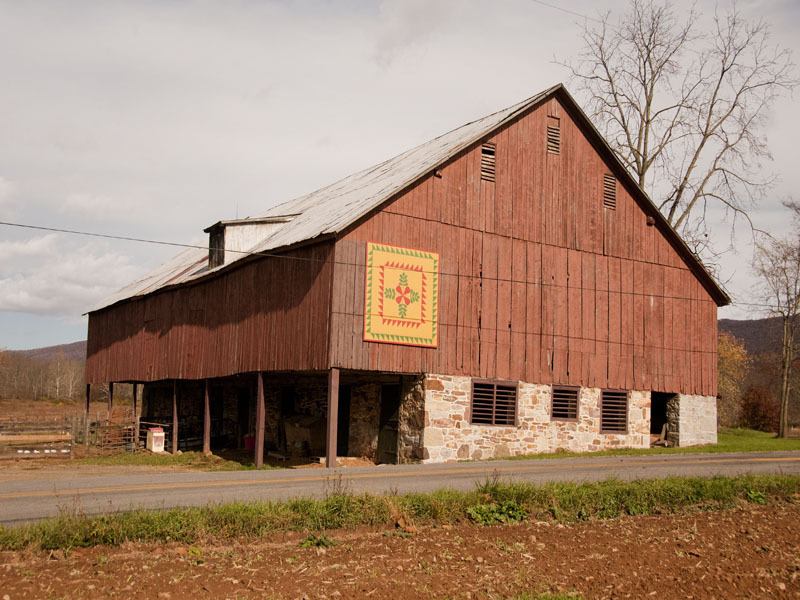 Art students at Southern Fulton High School in Warfordsburg, PA, designed and painted the barn quilt block from a photograph of the original quilt in mustard, red, and green. It was hung on the barn compliments of JLG using a new model platform lift. The barn is believed to date to 1820, the same year as the limestone farmhouse. Both were built during the ownership of James Nelson, a Revolutionary War veteran.